Home > Knowledge Center > What Kind of Exterior Maintenance Does my Coastal Home Need? Waking up to ocean breezes is the stuff that dreams are made of, but Southern California sun and salt in the air means regular maintenance on homes located near the beach. We spoke with family-owned and operated Chism Brothers Painting about concerns faced by their clients near the ocean here in San Diego. 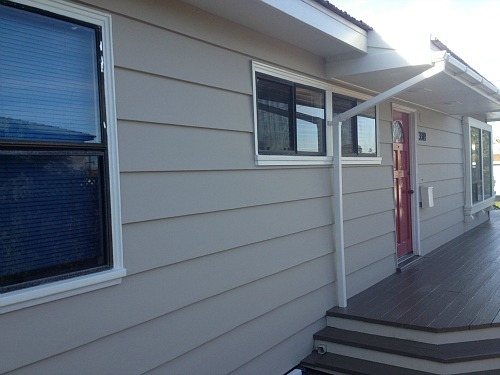 The home in the above photo is a recent repair the company did in Ocean Beach. And, here it is looking fantastic after power washing, priming and a fresh coat of paint. Considering purchasing a home near the beach or perhaps neglecting the exterior of the one you already own? We bet you’d like to know how much exterior maintenance is reasonable to expect in coastal Southern California and what the potential issues are. The sun’s ultraviolet rays break down chemical compounds in paint. Photodegradation is fading caused by the sun. In fact, it’s not always that noticeable until you compare a sun-exposed portion of painted surface to a newly-painted or non-exposed portion. Dark colors are particularly vulnerable though whites can yellow. During a hot summer, you might notice the paint on your door bubbling or blistering like it’s going to pop (and it usually does). The paint becomes so hot that it boils like water, sort of. The problem is that when it does pop, the wood or stucco beneath becomes exposed to the elements and it’s something that should be repaired immediately. Inspect the wood carefully to make sure none of it needs to be replaced. The sun dehydrates paint over time and causes chemicals to rise to the surface. What happens is you’ll see a fine layer of white powder on top of a painted surface that looks like, you guessed it, chalk. To be honest, all paints will chalk over time to some degree, but this can be delayed by priming and using a high-quality paint. You might remember our discussion about selecting landscape lighting fixtures for coastal homes as salt air can damage almost all metals. 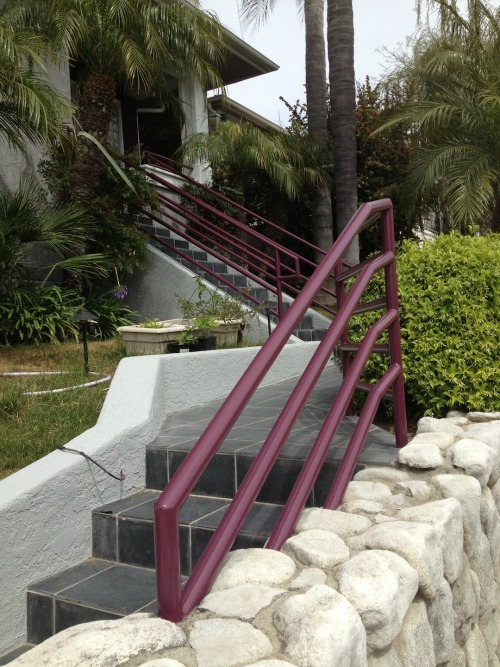 The photo below shows a metal railing in need of repair at a coastal San Diego home. Think about it—we not only have salt in the air due to proximity to the ocean, but we have that wet, coastal fog hovering over our homes throughout the year. Both aren’t great for metal surfaces, but staying on top of maintenance can help. 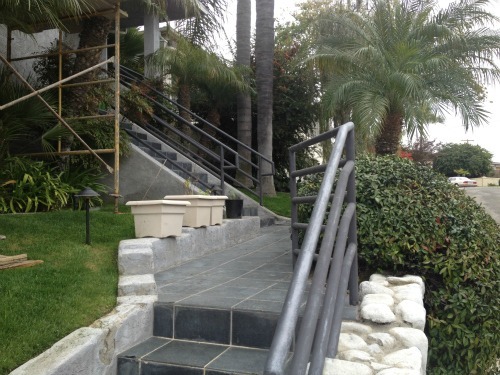 Here’s the same metal railing with a fresh coat of paint. If the metal isn’t naturally-resistant (like copper) or powder coated for protections, it will need to be painted to protect the metal from moisture. It’s particularly important to keep any seaside metal clean and free from bird droppings. Sea salt is hard to see so, in the case of a railing, wipe it down with a slightly damp rag every so often. You guessed it. 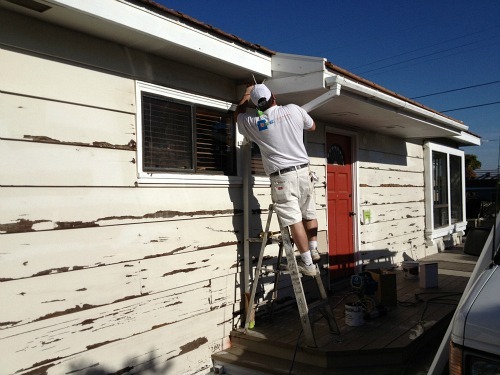 Homes with stuccoed exteriors need diligent maintenance because once moisture seeps into a crack, it actually will travel to spots where the stucco’s bond is loose. What is stucco supposed to do? It’s supposed to keep water out. So, if water gets trapped in between stucco and your house, mold and other damage can occur. The end result is not only will the crack need to be repaired, but even more stucco may need to be chipped away to release the trapped water or dry out moisture wherever the water traveled to. Usually, a bubble will appear to indicate trapped water. Behind stucco is metal lath that looks like chicken wire (and, way back when, it was chicken wire). If moisture gets trapped near the lath, in severe cases, the lath can begin to unravel leaving the metal wire to pierce the stucco. Stucco itself is sand-based and porous, however, homeowners usually paint stucco or use a color-coated top coat to provide moisture protection. Chism Brothers says that another big concern their clients have is maintaining stained surfaces such as wood doors and garage doors. Here, the Southern California sun is the enemy even on doors that don’t receive direct sunlight or get too hot. Stain keeps moisture out, but the warm weather wears it down. It’s easy to tell when a wood surface needs a new coat as it looks dehydrated and dry. Expect to maintain a wood garage door or front door biennially at the very least near the beach regardless of how much sun it gets. However, homeowners steps from the beach might need annual maintenance on their wood doors. Homes within a few steps of the beach could realistically expect annual or biennial maintenance to painted surfaces. The most important thing to do is catch the damage early. Chism Brothers suggests careful and frequent inspections of coastal home exteriors help prevent costly repairs. In a coastal environment it is extremely important that the surface you’re painting or staining is prepped properly. All peeling paint should be sanded off and sanded to ensure complete removal. Look for signs of warping or rotting wood and replace if necessary. Painting over damaged surfaces results in a shorter duration between repairs and perhaps further damage to the surface underneath if, for example, mold or moisture becomes trapped in the wood underneath the paint. Also, the paint may not adhere to the surface as well. Keeping a coastal Southern California home looking good can feel like a never ending job, but it is. The good news is that it’s totally worth it. *Photos courtesy of Chism Brothers Painting.